The 4I74 is a stackable PCI/104 card with eight quadrature up/down counters with quadrature count inputs, quadrature edge timestamping for velocity estimation and per channel index inputs. The 4I74 is intended for robotic, motor control, measurement, and instrumentation applications. The 4I74 has selectable TTL or RS-422 levels on its quadrature and index inputs. TTL or RS-422 operation is jumper selectable on a per input basis. The differential RS-422 inputs are suited for longer cable lengths and are terminated. In addition to the quadtrature counters, eight RS-422 serial ports are provided. Two ports can be run in RS-485 mode. These ports can be used for asynchronous serial communication, SSI or BISS encoder interfaces, Mesa Smart serial remote I/O communication or other uses depending on FPGA firmware. The encoder connectors are compatible with the 4I30 and 4I36. The 4I74 counters can count in normal quadrature mode (4X) or up/down mode. Programmable digital filtering is used on encoder inputs to reject input noise. The 4I74 counters may cleared individually. Each counter has a option to be cleared or latched by either the rising or falling edge of the index signal. Maximum count rate of the 4I74 with TTL inputs is 4 million counts per second. Maximum count rate with RS-422 inputs is 10 million counts per second. 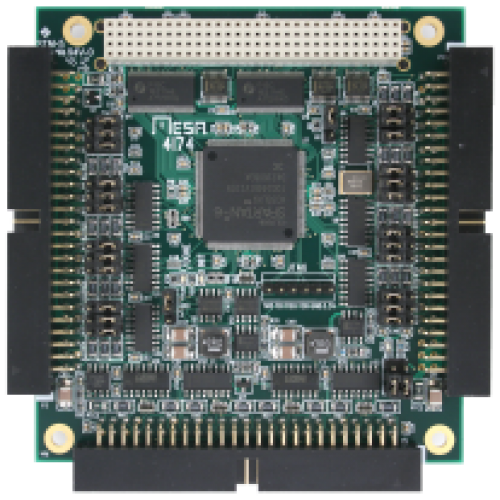 The 4I74 uses a FPGA chip for all counting and I/O so can be easily upgraded or modified in the field for specific requirements. The FPGA configuration flash memory can be updated from the host, no special cable or adapters are required.